The study of languages is receiving increased emphasis due to today's world of international communication, travel, and the need to better understand our neighbors throughout the world. Study of another language not only provides individuals with the ability to express thoughts and ideas for their own purposes, but also provides them with access to perspectives and knowledge that is only available through the language and culture.The World Languages Department offers courses designed to meet both college entrance requirements and the interests and needs of all students. In sequential courses, spoken communication is given major emphasis. Reading and writing are emphasized at the novice, intermediate and advanced levels. As language competency cannot be separated from the culture and customs of the people who use it, all language courses will cover the history, civilization and customs of the target language in comparison to the learner’s language and culture. The proficiencies acquired through the study of languages and literatures give language learners cognitive, analytical, and communication skills that carry over into many other areas of their academic studies. May be taken as a semester or year-long course. French Conversation and Culture offers the student an exciting introduction to the French language and culture. This course introduces the basic conversational vocabulary of French speaking countries and their culture. Students are encouraged to practice the language, as well as explore and experience cultural differences. The study of French begins with emphasis on listening and speaking. The fundamentals of reading and writing are also started at Level 1. Basic skills in grammar are covered enabling students to handle the oral and written language structures. The reading selections provide an overview of French culture with an emphasis on the differences of lifestyles and living conditions.This course meets the approved "E" requirement for UC A-G. Recommendation: Successful completion of French 1, or teacher recommendation. This course is a continuation of basic grammar, verb formation, vocabulary study, and listening and speaking exercises. The reading selections provide an overview of a segment of the culture with emphasis on an understanding of lifestyles and living conditions.This course meets the approved "E" requirement for UC A-G.
Spanish Conversation and Culture offers the student an exciting introduction to the Spanish language and culture. This course introduces the basic conversational vocabulary of Spanish speaking countries and their culture. Students are encouraged to practice the language, as well as explore and experience cultural differences. The study of Spanish begins with emphasis on listening and speaking. The fundamentals of reading and writing are started at Level 1. Basic skills in grammar are covered, thus enabling students to handle oral and written language structures. The reading selections provide an overview of Spanish culture with an emphasis on the differences of lifestyles and living conditions. This course meets the approved "E" requirement for UC A-G. Prerequisite. Basic or intermediate speaking and comprehension skills in Spanish. This course is designed for heritage Spanish speakers. Major emphasis is placed on the development of Spanish literacy. Students will experience extensive study in reading, writing, listening and speaking skills.This course meets the approved "E" requirement for UC A-G. Recommendation: Successful completion of Spanish 1, or teacher recommendation. This course is a continuation of basic Spanish grammar, verb formation, vocabulary study, and listening and speaking exercises. The reading selections provide an overview of a segment of the culture with emphasis on an understanding of lifestyles and living conditions.This course meets the approved "E" requirement for UC A-G. Recommendation: Successful completion of Spanish For Spanish Speakers 1 or by teacher recommendation. This is an enriched year-long course for heritage Spanish-speaking students and students enrolled in a dual-language setting at the junior high level.. The major emphasis of this course is placed on the development of Spanish speaking, reading, listening, and writing skills at the intermediate level. The study of Hispanic literature and culture is integrated with Spanish Language Arts. This course meets the approved "E" requirement for UC A-G. Recommendation: Successful completion of Spanish For Spanish Speakers 2 and/or teacher recommendation. 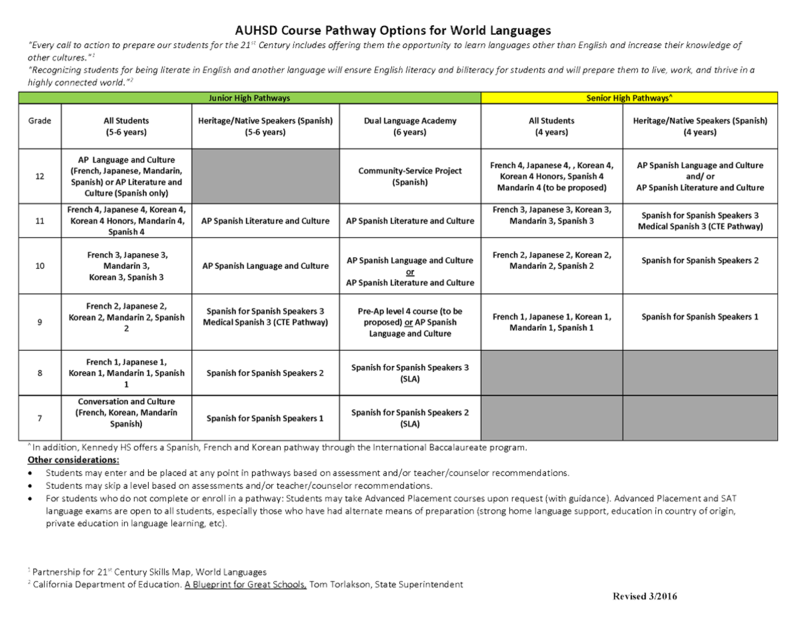 This is an enriched year-long course for heritage Spanish-speaking students and students enrolled in a dual-language setting at the junior high level.. The major emphasis of this course is the development of Spanish speaking, reading, listening, and writing at an advanced level. The study of Hispanic literature and culture is integrated with Spanish Language Arts. This course meets the approved "E" requirement for UC A-G. The study of Japanese begins with emphasis on listening and speaking. The fundamentals of reading and writing are started at Level 1. Basic skills in grammar are covered, thus enabling students to handle oral and written language structures. This course meets the approved "E" requirement for UC A-G. Recommendation: Successful completion of Japanese 1, or teacher recommendation. This course is a continuation of basic Japanese grammar, verb formation, vocabulary study, and listening and speaking exercises. The reading selections provide an overview of a segment of the culture with emphasis on an understanding of lifestyles and living conditions. This course meets the approved "E" requirement for UC A-G.
Korean Conversation and Culture offers the student an exciting introduction to the Korean language and culture. This course introduces the basic conversational vocabulary of Korean speaking countries and their culture. Students are encouraged to practice the language, as well as explore and experience cultural differences. This course teaches the students fundamental skills in Korean. Students learn Korean letters, reading, writing, and fundamental conversation. Students learn Korean vowels, consonants, and correct language structure for basic conversation. Students can construct a simple essay in Korean. Vocabulary and elementary grammar are introduced. Syntax study including the usage of conjugation and particles are emphasized. The skills of speaking, listening, reading, and writing in the language are the essential elements of the course. The methods of correct pronunciation are emphasized.This course meets the approved "E" requirement for UC A-G. Recommendation: A grade "C" or better in Korean 1 or teacher recommendation. Students continue to develop the fundamental language skills in Korean. Vocabulary and grammar are expanded. Syntax study including the usage of conjugation and particles is emphasized. Students will construct a simple essay form in Korean. Topics include writing letters, diary, entries and descriptive essay. Supplementary reading material is selected in various sources: short story, poem, and modern magazine. Chinese Conversation & Culture offers the student an exciting introduction to the Chinese language and culture. This course introduces the basic conversational vocabulary of Chinese-speaking countries and their cultures, with an emphasis on Mandarin. Students are encouraged to practice the Mandarin language, as well as explore and experience cultural differences. This course teaches the fundamental skills in Mandarin. Students develop skills in listening, speaking, reading and writing. The reading selections provide an overview of Chinese culture.This course meets the approved "E" requirement for UC A-G. Recommendation: Successful completion of Mandarin 1, or teacher recommendation. Students continue to develop the four skills of listening, speaking, reading, and writing, with the added component of research and presentation. Research topics of a comparative nature between the Mandarin and the American ways of life are a major focus, and oral presentations are required with the associated research. Reading selections are broader in scope and content, with emphasis in the development of writing styles and reading comprehension. This course is for non-heritage, non-native speaking students. Learners are provided opportunities to participate in interpersonal, interpretive, and presentational communication; experience cultural products and practices and reflect on the perspectives that underlie them; acquire knowledge and new perspectives from authentic target language sources; learn about the nature of language and culture and how each manifests itself in human communication; and takes language beyond the classroom in real-world interactions. Course topics are related to exploring the Arab world, self-introduction, family, friends, school, daily routine, food, restaurants, markets, clothing, likes and dislikes, directions and more. Course is focused on Heritage Arabic Speakers. Native Arabic-speaking students will participate in interpersonal, interpretive, and presentational communication; experience cultural products and practices and reflect on the perspectives that underlie them; acquire knowledge and new perspectives from authentic target language sources; learn about the nature of language and culture and how each manifests itself in human communication; and take language beyond the classroom in real-world interactions. Students will explore the nature of growing up between the two worlds of the Arabic culture and the American culture, the uniqueness of interaction among their families and their community, and the potentials of promising future. Students will address topics related to self and the immediate environment, including family and friends, hobbies and activities, sports, school, social relationships, people in the community, professions and the working world, health, holiday and celebrations, cuisine and recipes, clothing and fashion, and more. Completion of Arabic 1 P or equivalent. Learners are provided with opportunities to participate in interpersonal, interpretive, and presentational activities; experience cultural products and practices and reflect on the perspectives that underlie them; acquire knowledge and new perspectives from authentic target language sources; learn about the nature of language and culture and how each manifests itself in human communication; and take language beyond the classroom in real-world interactions. In the first semester, the students will learn about suburban and rural life in the Arab world; will learn about pets, farm animals, and wild animals in their habitat and how to describe them; and will explore folk tales in the Arab world and how many of them impacted folk tales in the West. In the second semester, the students will learn about the Arabic countries’ locations on the map and the most important landmarks in some of them; will discuss most important holidays and celebrations in the Arab world; and will learn the names of different hobbies and sports and explore the most popular sports in the Arab world.